Wanna get organized? Follow us! These mouth-watering gems are a great way to sneak some veggies into your morning! In a large mixing bowl, whisk eggs; add remaining ingredients and mix well until fully incorporated. Stir in vegetable mixture until evenly mixed. Spray 12-cup muffin tin with cooking spray and spoon egg and veggie mixture into each cavity. If desired, sprinkle additional shredded cheese on top each. Bake at 400 for approximately 20 minutes or until firmly set. Allow to cool slightly before serving. Make-ahead tip: Allow quiches to cool completely before transferring to an airtight container. Use coffee filters on bottom, top, and between layers to absorb any excess moisture. Heat in microwave on high for 2 to 2.5 minutes. Will keep in refrigerator for up to 5 days. Don't skip the most important meal of the day just because you're short on time. This refreshing, healthy morning pick-me-up is ready in no time and perfect to take on the go. Combine all ingredients in blender and process until smooth. For best results and to save time in the morning, bag the first four ingredients together in a small zip-loc bag and freeze. Create enough bags for the entire week (or longer)! When you're ready to make one, just dump the contents into the blender, add the yogurt and milk and blend. Start your day off right, with this yummy breakfast ready and waiting to warm you up from the inside out! This recipe was inspired by one I found on Pinterest from frugalupstate.com. Leftovers reheat well in the microwave (do not add more milk or the maple syrup until ready to eat). Combine first nine ingredients in a slow cooker and stir. Cook on low for 8 hours. After serving, add more milk to reach desired consistency and drizzle with maple syrup. Oh yes, you can have piping hot, homemade, from-scratch apple muffins the kids will love on the table within 20 minutes! The best news is that there is no peeling, coring, or chopping required. These freeze really well and can be re-heated for those busy weekday mornings, too. Individually wrap each cooled muffin in plastic wrap and then store in a freezer bag or container. Simply re-heat in the oven (I put mine directly on the oven rack) for about 5 minutes at 375. Not only are these cookies healthy (being low in fat and sugar, high in fiber and gluten-free), they are delicious! The aroma was calling me to the kitchen well before they were finished baking, and I consumed three of them just in the time it took me to transfer them from the baking sheet to the cooling rack. This recipe was adapted from one I found on bionicbites.com. I accidentally added too much sugar to the original recipe, so I went ahead and doubled it. I prefer a nutmeg/cardamom pairing with bananas over cinnamon, so I swapped that out. I also love dates, so I substituted them for the raisins and added some coconut for interest and texture. I also reduced the baking time slightly because I like my cookies a little soft/chewy and I wasn't patient enough to wait any longer. They turned out perfect! These are best eaten warm and make a healthy and delicious breakfast you can eat on the go. Preheat oven to 350. Combine first seven ingredients in a medium mixing bowl. Stir in the dates, walnuts and coconut. Drop spoonfuls of mixture onto a greased cookie sheet and flatten. Bake for 30 minutes, then flip over and bake another 10. OMG! A healthy breakfast or snack is just minutes away using ingredients you probably already have on hand. Experiment with your favorite add-ins...we used coconut, and it was yummy! Melt honey and coconut oil together in a medium saucepan. 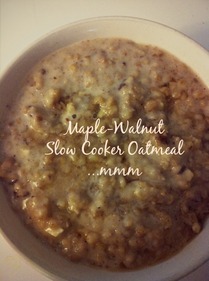 Add oats and nuts and stir until well coated. Spread in a thin layer on a backing sheet and sprinkle liberally with pumpkin pie spice. Bake at 300 for 10-15 minutes or until golden, stirring once halfway through. Allow to cool completely. Stir in add-in ingredients, if desired, and toss until well combined. Make sure mixture is completely cooled before storing in an airtight container.